PRMc is a compact all-in-one solution for document reading and verifying. The built-in digital signal processor unit (DSP) significantly speeds up image-processing, thus efficiently reduces queuing time. World leader OCR algorithm: all PRMc passport scanners use the high performance Optical Character Recognition (OCR) algorithm that has been developed by ARH Inc.
More reliable and faster operation: passport data extraction is now all-time effective. We equip every single PRMc passport scanner with high performance DSP (Digital Signal Processor) which results in better and more accurate image recognition. Fast MRZ data reading: the PRMc passport scanner is an ideal solution for MRZ data reading of passports. The image taking process and the MRZ reading is fast and reliable and they both take less than a second together. Excellent image quality: the built-in cameras in the new PRMc passport scanner take high resolution (2048x1536 pixel, 24bit colour depth) images of documents that are put into the device. These high resolution pictures are taken by the cameras with every illumination separately. Upon request we can also deliver the devices with 600 PPI or even 1200 PPI optical resolution support for specific parts of the image. Flexibility: ARH Inc. accepts production requests for smaller quantities which make it possible to meet your and your customer's requirements in the most flexible way. If you do not find the device that you are looking for, we are ready to modify our devices according to your needs. We are able to manufacture custom (OEM) devices in our own manufacturing facility: you may request the devices with different color case, other device options, custom design, different configuration etc. The new PRMc document scanners are a smart combination of traditional document scanning devices: fast, accurate and reliable machines that effectively help your daily business with performance and stylish look. You can read every, standard travel documents and ePassports with the new PRMc. We attach an all-around Software Development Kit (SDK) and drivers on a CD-ROM therefore you can easily design and build your own, fully customized document scanning system to your clients. The attached SDK supports numerous Operation Systems and programming languages, as a result you can integrate our PRMc reader into your system seamlessly. Our system integrator partners usually turn to us in order to build a high quality, complex document reading system. 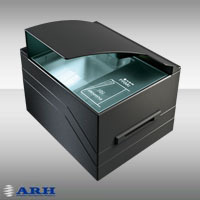 We, at ARH work on developing automatic document reading and checking products and applications for over 10 years. as part of our partners' complex information systems.